The much awaited UC Browser7.6 is now officially out of beta the new version is focused more on speed and page rendering, in order to bring users multiple choice when they feel frustrate by using Opera Mini. UC Browser7.6 also supports New Social Element for Java & WM which will help users to share and update Facebook & Twitter in one go. They have also tweaked its graphical user interface.You can find this latest update version in www.ucweb.com by PC or wap.ucweb.com by handset. 1. Faster Than Ever Before: UC optimized the UC Server to bring a 30% plus of browsing speed. 2. WAP 2.0 Support: Added the float support to make page rendering cool. 3. GUI Optimization: Make UC Browser more beautiful. 5. Thumbnail When you Upload Photos: UC Browser support the thumbnail image when you upload photos, to make a better and convenient upload experience. 6. Added Traffic Check: With what you can check your traffic consumption from UC, in order to match your browsing with your data plan, and also get exact data about how much traffic saved by UC Browser. 7. 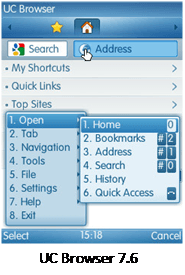 Search Box Optimization: UC put all the search engine options at the top, in order to save the space for low resolution handsets. 8. WLAN Automatic Switch: Since WLAN is used more and more widely, UC started to support the WLAN Access Automatic Switch in order to save user’s time to switch the APN when they changed their location. 9. Theme Automatic Installation after Download: To save the users’ operation steps, UC added this feature. 10. Clear Fonts: To match the English language’s outline, UC set the default fonts to be a small one to make a better screen adaptation. 11. Free Copy to Support “Newline Character” & “Space Character”: Support this to bring users a more smooth copy experience. its there on android :P…since last yr ! !